Energy, engagement, motivation, tenacity and even happiness are among the characteristics that might be considered outcomes of high wellbeing and resilience. This modular course approaches wellbeing and resilience with a holistic hat on, going beyond simply wellness, combining both physical and mental aspects to create helpful habits, and build the skills and mindsets of resilience. In recognition that there is no one-size-fits-all solution, the course is designed to help each of us discover our own unique path. Each module can be delivered in a short session, typically two hours a week over seven weeks. In each we examine practical ways of enhancing wellbeing and resilience, and suggest short experiments to undertake during the following week. 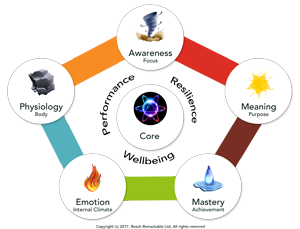 The modules are based on our unique 6-Element Model, itself informed by modern empirical science, to create useful change in our approach to work and life. Each module is a mix of exercises, conversation and concepts designed to make the theory real and practical, supported by suggestions for delegates to undertake their own experimentation. Module 7 – From micro to macro: What now? Combing the latest thinking, with practical approaches to implementation, our goal is simple – make a positive difference in the workplace that benefits each individual involved, the people they work with, and the outcomes they deliver in their role. Have question, or would like to explore this area? Do get in touch!